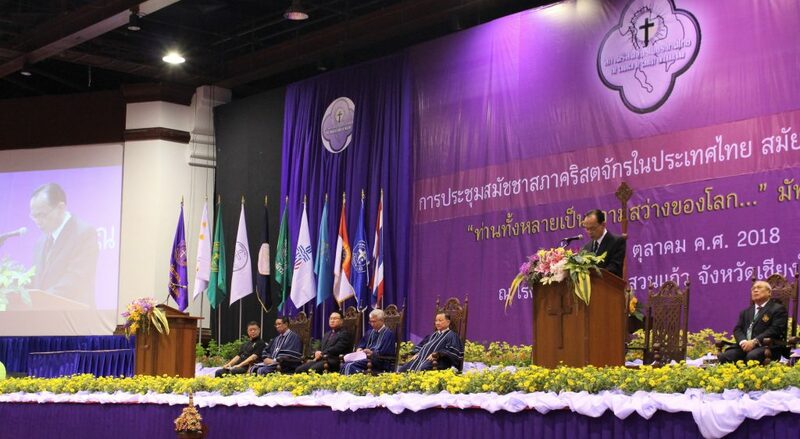 The 35th General Assembly of the Church of Christ in Thailand (CCT) was opened in an opening worship service led by the Moderator of CCT Rev. Dr. Thawesak Mahachavaroj at the Lotus Hotel in Chiang Mai, Thailand. The theme of the General Assembly being held from 22 to 26 October 2018 is “You are the light of the world” based on the gospel of St. Mathew 5:14. More than 1000 delegates from all over Thailand, as well as representatives of mission agencies and ecumenical organisations, are attending the assembly. “CCT’s support to CCA in various ways during the past 61 years demonstrates the significance of a special place for CCA in CCT’s history and vice versa. No other church in CCA membership and fellowship can claim such a unique privilege”, added the CCA General Secretary. Dr. Mathews George Chunakara further stated that the theme CCT had chosen for the 35th General Assembly, “You are the light of the world”, was pertinent in the current Asian and global context. “The message conveys through this metaphor in the gospel of St. Mathew teaches us something very significant and Jesus likens His disciples to be the light of the world. It is not only a great compliment but also a reminder about the enormous responsibility of all disciples”, the CCA General Secretary said. The history of the first Protestant Church mission in Thailand dates back to 1828 and subsequently, several Western mission agencies were involved in propagating the gospel in different parts of the country. The CCT was founded in 1934 as a united church. The General Assembly meets once every two years and the election of the new leadership takes place once every four years. The CCT is the only member church from Thailand of both the Christian Conference of Asia and the World Council of Churches. To view the full message click here.